The bomber who attacked a busy central Brussels rail station probably made the bomb at his home, where explosive materials were found, the federal prosecutor's office said Wednesday. "Preliminary results of the search carried out in the residence of the suspect ... showed that he probably made the bomb there," spokesman Eric Van Der Sypt said in a statement. "Both possible chemical substances and materials were found that could serve to make explosives," he added. Belgian authorities on Wednesday identified the bomber killed by soldiers in a busy Brussels rail station as a 36-year-old Moroccan national. "The assailant has been identified as O.Z., born 20 January 1981 and of Moroccan nationality," spokesman Eric Van Der Sypt said at a press conference after Tuesday's attack. "He was not known to the authorities for any terrorism connection," Van Der Sypt said, declining to give the man's full name while the investigation continues. The bomb that he detonated consisted of a suitcase containing nails and gas bottles, Van Der Sypt said as he gave a dramatic account of the attack. "It could have been much worse," he said. "It is clear that he wanted to cause more damage than he did." 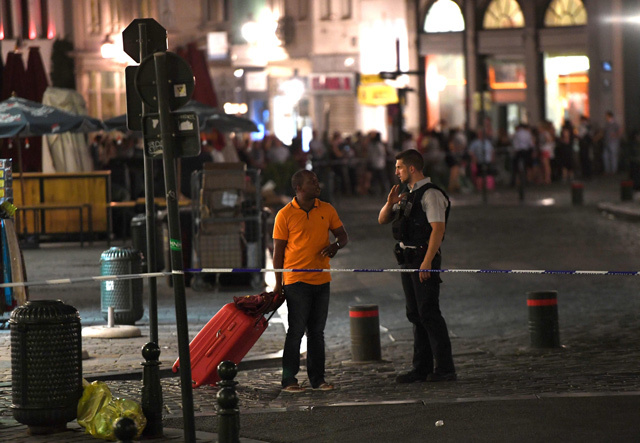 The suspect entered the Central Station at 8:39 pm (1839 GMT) and twice approached a "group of passengers", the second time standing in the middle of them, Van Der Sypt said, adding that there were around 10 people. "He grabbed his suitcase while shouting and causing a partial explosion. Fortunately nobody was hurt," he said. "The suitcase immediately caught fire. The man then left his luggage burning and went down to the platform in pursuit of a station master. "Meanwhile the bag exploded a second time more violently. This bag contained nails and gas bottles. "The man then returned to the hall where he rushed to a soldier. The soldier immediately opened fire and hit the individual several times. The latter die on the spot as a result of his injuries," he said. The suspect was not wearing a suicide belt, as some Belgian media had reported, Van Der Sypt said. Belgian security forces have identified a man who set off an explosion at a Brussels train station before he was shot and killed, Interior Minister Jan Jambon said on Wednesday. "The terrorist's identity is known. We have been able to identify him," Jambon told RTBF radio television without giving further details. Jambon said the attack could have been much worse because the "big explosion did not happen," adding more details about the device would be released shortly. Jambon indicated that police had carried out searches given the attacker's identity was now known. There were no other casualties apart from the suspect, who was confirmed dead by prosecutors several hours after the attack. Crying rail passengers fled the station in the heart of Brussels after the explosion, with memories still fresh of last year's metro and airport suicide attacks in the city that hosts the EU's headquarters. Brussels has been on high alert since suicide bombers struck its main Zavantem Airport and Maalbeek metro station near the EU headquarters in March 2016, killing 32 people and injuring hundreds more.